In a few days, many families will celebrate Diwali, known as the festival of lights. Diyas, or oil lamps, will recall those that are said to have lit the way as Rama returned, in the dark night of the new moon, to the kingdom Ayodhya with his wife, Sita, and his brother, Lakshmana, after 14 years of exile and after having slayed the demon Ravana. This is a central story of the ancient epic poem Ramayana, which is attributed to the Hindu sage Valmiki. Many retellings of the Ramayana exist. Significantly, the stories of Rama’s journeys and deeds have been carried forth in the oral tradition. Customary tellings recount Rama’s bravery, virtue, strength, and heroism and depict various ideals of son, ruler, and husband. Rama honors his father, the king, by proceeding into exile as ordered. Later, he works with the devoted Hanuman, the vanara, to rescue Sita from the clutches of Ravana, who had abducted her. But what would be different if Sita told the story? How did she experience the events? What were her thoughts about the actions of Rama, Hanuman, and Ravana? Sita’s Ramayana takes on this inquiry. It retells the epic in the first person, from Sita’s perspective. And it does this in graphic novel form. 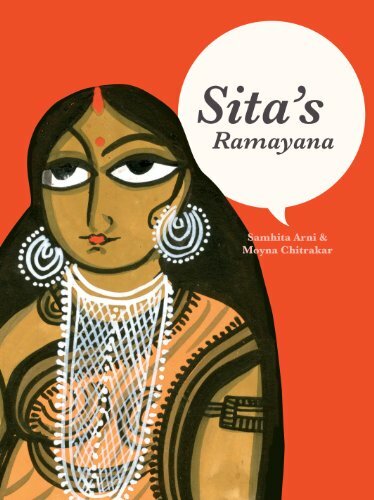 Sita’s Ramayana is a remarkable book, a beautiful achievement. The visually stunning graphic novel is the result of a worthy collaboration between Moyna Chitrakar, a scroll-painter of the Patua folk art tradition, and acclaimed writer Samhita Arni. It is fascinating that, in this project, the illustrations preceded the text. The art of Chitrakar’s scroll painting, which visually tells Sita’s story of the Ramayana, was restructured to the graphic novel format. Arni wrote the text to match Chitrakar’s art, expressing Sita’s questions and perspectives. The graphic novel is an appealing format for this story. The visuals advance the narrative rapidly, show us the consequences of the characters’ actions, and, significantly, let us see Sita’s reactions. The stated target readership of 10 and above is appropriate. The story is complex, and it presents difficult themes of war, violence, death, and betrayal. The opening two pages lay out a cast chart that is particularly helpful to readers unfamiliar with the traditional tale. It maps all the story’s characters, from the central to the peripheral, and shows the relationships among them. This in itself sets the stage for some of Sita’s questions: Why do family members treat each other the way they do, even in carrying out purportedly virtuous acts? How are women so often left out of the equation in matters of war, pride, and heroism? Indeed, Sita’s Ramayana ventures beyond a graphic retelling the events of the epic tale. It recounts the events of the Ramayana—the misdeeds of Ravana and the heroism of Rama—but it does not stop there. The book meditates on the impact of war on the warriors’ survivors—usually women. It raises questions about the validity of honor as a motivation for aggression, about appropriate means of achieving protection and rescue. No less, Sita’s Ramayana is a superb model of how the modern publishing industry can preserve, even advance the relevance of folk art, and how the oral tradition conveys thoughts and perspectives that might be lost in the written record.